Welcome to the American School 25th Anniversary Golf Tournament! The sponsors cordially invite the first 128 golfers (32 teams of four) to participate in this fun event at the El Tigre Golf Course. All amateur golfers, men, women and kids are invited for this fun event to raise funds for the American School of Puerto Vallarta. The format is a 4-ball scramble. All four golfers hit their individual drives. The best drive is then selected and all four golfers hit their second shot from there. The process continues with all four golfers putting from the location of the best approach shot until one of the four balls is in the cup and the score is recorded. There will be a 9:00 am shotgun start from each of the 18 holes. The tournament will be conducted under the Rules of USGA, the Mexican Federation of Golf and the El Tigre local course rules listed on the scorecard. The Rules committee will be in charge of enforcing all rules. All decisions of the committee will be final. Each team should assign one person, the team captain, to record the team's score on each hole. The tournament committee is responsible for the addition of the scores. The scorecard will be returned to the scoring table immediately upon following play. The captain and the team members testifying the correctness of the score must sign the scorecard. It is every player's responsibility to play without undue delay. The Marshall will warn groups that are out of position. If a group receives three warnings, the golf committee will assess 2 penalty strokes to the team. The lowest team score will break ties in the following manner: first, by the lowest score for the last nine holes, second by the lowest score for the last six holes, third, by the lowest score for the last three holes. If the tie continues, the same procedure will be used for the first nine holes. Soft spike shoes are required of all players. The gentlemen will play from the white tees, the ladies and kids from the red tees. Trophies will be awarded to each member of the winning teams. Merchandise awards will be given for the "closest to the hole" on three par 3's. At each of the holes there will be a neutral judge who will be responsible to determine which ball is closest to the hole. The One Million Dollar Shoot Out will consist of players who qualify in first place on each of the designated closest to the pin holes and will participate in the shoot out at the end of the competition (a 165 shot on hole 18). The first player to make a "Hole in One" on a designated hole will win a 2012 automobile. 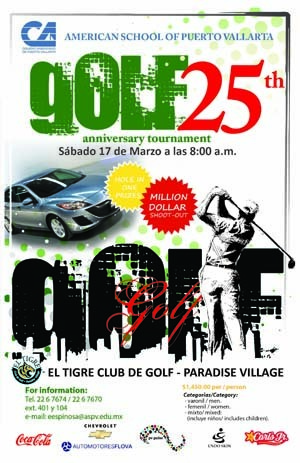 The tournament will be held on March 17, 2012, with a 9:00 am Shotgun start at El Tigre Golf Club, Nuevo Vallarta. At 2:00 pm, there will be an Awards & Prizes cocktail party with Taquizas (Taquizas are informal gatherings in Mexico where people stand around the grill or the table with tortillas in hand ready to make their own tacos). The donation entry fee is 1,450 pesos per golfer. Player registration will close whichever comes first with the limit of 128 golfers (32 teams) or when the first ball is hit in the tournament. The Tournament Committee reserves the right to reject the registration of any participant without any responsibility other than to refund the registration fee. In case of disqualification, no refund will be given. The Tournament Committee additionally reserves the right to modifications at any time during or before the tournament. The Rules Committee will resolve any issues or controversies that arise with regard to the application of the rules of golf during the course of the tournament. All rulings will be final and without appeal. All recommendations, notes or prize conditions will be given to participants during the registration process or will be posted in a visible location in the Club House. The members of the Tournament Committee are Gerald Selitzer and Eduardo Espinosa. The Rules Committee is Golf Professional Francisco Salazar. Email contact is Eduardo Espinosa at eespinosa@aspv.edu.mx.